A while ago, at the same time as Matt and Reggie, I posted my Top 100 All Time Favourite (Metal) Albums over at the forum The History of Metal on FB. It took a good amount of time and effort to put it together, but it was so much fun! My taste in metal is always changing, so the list will not always look the same. In fact, it’s already a bit different than it was when I first put it together and posted it on the forum seven months ago. I tried to limit myself to three albums per band to make the list a little more diverse and interesting. I don’t really consider the ‘test of time’-factor when selecting what albums that will go on my list, instead I measure it by how strongly the album has affected me emotionally and how much/often it has helped me through both good and bad phases in my life. That’s why you can find quite a few newer releases among my favourites too. Accessible and infectious, but still tastefully complex with a modern feeling. I like the versatility of this album, it’s good if you need positive energy, it’s heavy and powerful enough to headbang to, at the same time it’s relaxing, works for sing along when you want to practice your growling skills, it’s quite family friendly, perfect for private air-guitar performances and beautiful enough to keep you company on cold winter nights. What more can you ask for? Post rock mixed with black metal is one of the best combinations of musical styles. Add a dose of jazz, intense emotional singing and some proggy elements and you have Lantlôs. Their music makes me close my eyes and completely lose track of time. The album has an unusual dark, flowing feeling to it that makes every song a pleasure to listen to. To me, this is an atmospheric masterpiece where the music perfectly pictures the album’s lyrical theme. The most beautiful troll album ever. I love every second of it and every sound, from the frog’s “ribbit”, the trolls gnarling while sharpening their knives and the owls howling. It’s not a typical Finntroll album and it’s partly what makes it so good; this is more atmospheric, full of emotions with many instrumental parts and nature-related sound effects. It’s dedicated to Somnium, a band member that passed away, and they really managed to create something unique for him. Because the music juuust floooows and wanders in such a nice, wonderful pace throughout the whole album. It’s so smooth and seamless. I barely notice when a track ends and a new begins, or the pause between the songs. This is one long, extremely beautiful listening experience that takes me away to another me(n)tal dimension and makes me relax completely. An album to daydream to. I don’t care about Watain’s dark and super-evil image and everything that comes with it. I simply like the music because of the awesome, detailed and powerful sound. This is not recorded in a deep forest in the middle of nowhere! It has the typical raw black metal atmosphere, but you can actually hear every instrument being played, which I appreciate. You can find a bit of Dissection and a small dose of Bathory here and there, but Watain has their own recognizable style and to me they are one of the very best black metal bands out there. 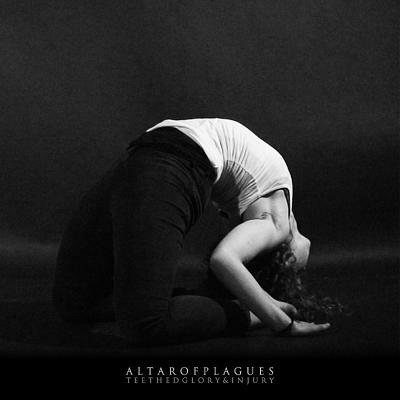 An album I have been enjoying immensely the past few weeks is Altar of Plague’s Teethed Glory and Injury. It’s post-black metal loaded with atmosphere, emotion and dissonance. I love how they mix disturbing sounds with angry vocals and beautiful, flowing, sometimes trance-like tunes. The strange video goes well with the song and is just as hypnotic and expressive as Altar of Plague’s music. I hope you like it, and don’t forget to check out the whole album; in my opinion the rest of the songs are even better than this one.